Participating artists: Allora & Calzadilla, Taysir Batniji, Lara Favaretto, Christian Burnoski, Jason Dodge, Claire Fontaine, Ori Gersht, Bethan Huws, Kris Martin, Pedro Reyes, Michael Sailstorfer, Yoko Ono & John Lennon; and a historical display of Llandudno in WW1. 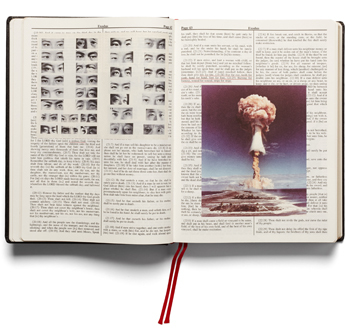 Broomberg & Chanarin, Holy Bible, MACK/AMC, 2013.
with contributions by Mark Durden, Alfredo Cramerotti, Broomberg and Chanarin, Jenifer Good, Aaron Rosen and Sara Bevan. In partnership with Artes Mundi.